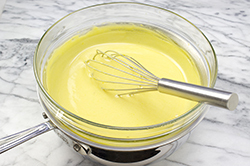 One of the great desserts of Italy is zabaglione, an ethereal warm custard made by whisking egg yolks together with Marsala wine over simmering water. Unfortunately, it needs to be prepared just before serving, which is a problem. 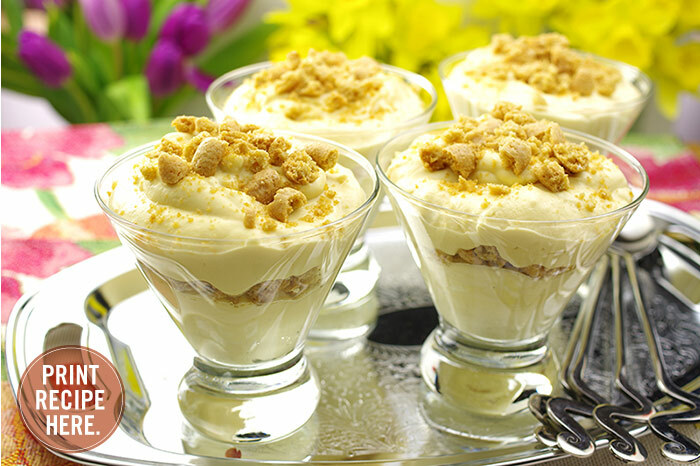 Instead, I make this cold zabaglione with whipped cream and crushed amaretti that’s even better made ahead. 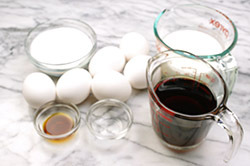 Place the egg yolks, sugar, and Marsala wine in a large heat-proof glass bowl and whisk them together. 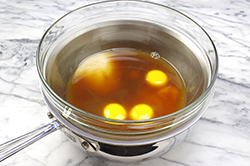 Place the bowl on a pan of simmering water to make a double boiler and whisk the mixture almost constantly for 5 to 7 minutes, until it expands in volume and becomes thickened. 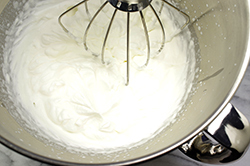 You’ll see the froth disappear and the whisk will leave a little trail in the mixture. Don’t walk away from it or you’ll end up with scrambled eggs! 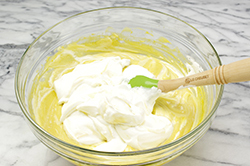 Off the heat, whisk in the vanilla and almond extracts. 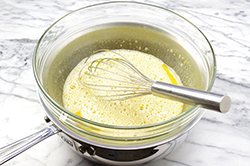 Set aside for 30 minutes to cool to room temperature, whisking once or twice as it cools. MAKE IT AHEAD: Prepare completely and refrigerate for up to 2 days. 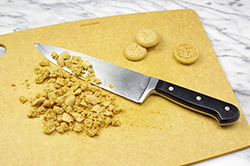 Sprinkle on extra crushed Amaretti before serving. NOTES: Amaretti di Saronno comes 2 in each wrapper; I use the cookies from 4 to 6 wrappers. Crush them lightly with the side of a knife blade. Recipes reprinted from MAKE IT AHEAD by Ina Garten. Copyright ©2014 by Ina Garten. Photographs by Quentin Bacon. Published by Clarkson Potter/Publishers, an imprint of Penguin Random House LLC.